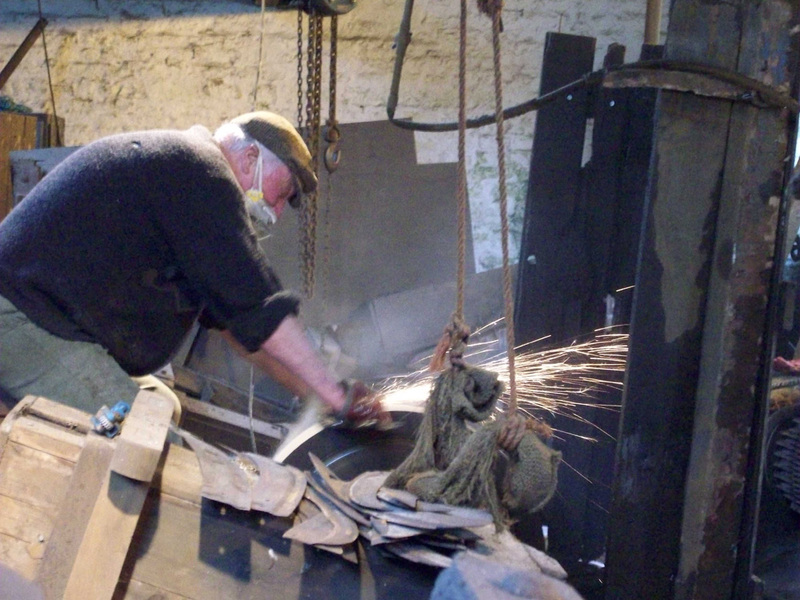 Abbeydale is an 18th century industrial works – one of the first working museums in the UK. It is the site of a former steel blade factory; its main product being agricultural scythes, although other bladed implements were made there. It is on the outskirts of Sheffield, on the banks of the River Sheaf, which was the water source that drove the mill wheels that powered the machinery. The site houses the only intact crucible steel furnace remaining in the world. 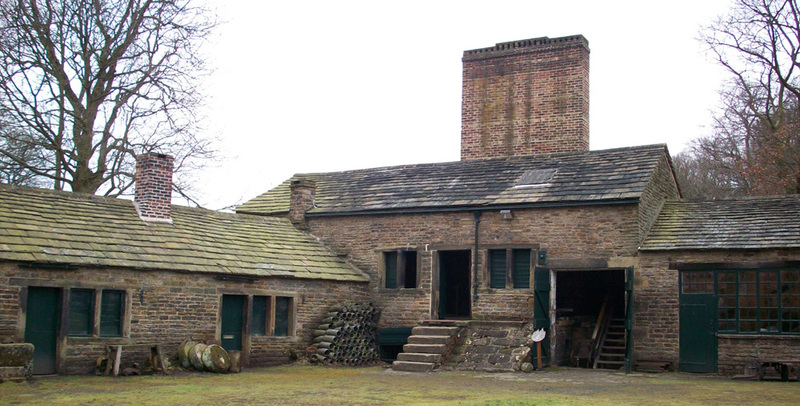 It was built in around 1830 and was the source of Abbeydale’s steel for manufacturing the various tools and implements. During a visit to the site it is possible to see the associated pot shop where the clay crucibles that held the raw ingredients for steel were made. The crucible furnace reached temperatures in excess of 1600 degrees Celsius. Making steel was hot, hard work. The crucibles full of molten metal were lifted from the furnace by a “puller out” and then poured from the crucibles by a “teemer” to form ingots. In turn, the ingots were forged under the site’s tilt hammers to create blank blades before they were sent on to the grinders to be given a sharp edge. The grinding workshop, or hull, contained six sandstone grind stones and two polishing wheels, all powered by a waterwheel. The stones were huge – taller than many of the workers – and suspended with their lower edges in a trough of water to keep the surface wet while the grinders worked. The grinder sat astride the trough and held the blade against the rotating stone to give it an edge. The work was hot, hard and dangerous with many hazards. The fine dust thrown off the stone during the process got into workers’ lungs, causing silicosis, a debilitating and usually fatal disease. But there was also risk of parts of the grindstone breaking away and causing injury or blindness. On some occasions the whole stone shattered, killing anyone close to it. For many years water was the only significant source of power to drive machinery. Mills were driven by a wheel, powered by the flow of a stream running past and turning the mechanism. It was not until the late 17th century when Thomas Savery, a military engineer, devised a system that he called the “atmospheric engine” that powerful pumps were available. Pumps were needed to raise water from mines to prevent flooding. By pumping out ground water it was possible to reach much lower depths and exploit new mineral veins. Savery used atmospheric pressure to drive his pump by filling the cylinder with steam then rapidly cooling it by running water over the surface of the engine. The steam quickly condensed with a massive reduction of pressure that pulled water out of the mine shaft. The system was inefficient and dangerous because it was liable to explode, so blacksmith Thomas Newcomen designed a new version that was more reliable and it was first installed in the Earl of Dudley’s limestone mines below Dudley Castle (West Midlands) in 1712. Newcomen’s engine was heavy and slow, but efficient, and it was adopted by mines all over the UK but in 1765 Scottish instrument maker James Watt realised that cooling the steam for each engine stroke wasted energy. He devised a way to keep the steam hot and to shift it to opposite sides of a piston and so produced an engine that had a powerful double stroke. His early efforts were dogged by technical difficulties but he was eventually taken on by Birmingham ‘toy’ manufacturer Matthew Boulton who created the massive Soho Foundry so that Watt could perfect his machine. Watt later developed an addition to his engine that enabled the straight stroke of the piston to be turned to circular motion. The rotary adapter revolutionised industry and made it possible for the first time to drive production machinery by steam. The Industrial Revolution finally had a power source equal to the ideas of its leaders and factories sprang up all over the country to manufacture goods. Formerly cottage industries were moved to centres of mass production with the mechanisation of all kinds of crafts from spinning and weaving to pottery and metalwork.